SIMEON TEN HOLT Simeon ten Holt was born in Bergen, The Netherlands, 24 January 1923. He studied with Jakob van Domselaer, eventually developing a highly personal style of music. Ten Holt generally uses consonant, tonal materials and his works are organized in numerous cells, made up of a few measures each, which are repeated ad libitum according to the player's preference. Many of Ten Holt's works employ harmonies quite similar to those used by European composers of the Romantic period. Thus, his style of minimal composition is truly European in its orientation and has been little influenced by North American minimal composers, whose works draw more often on rock, jazz, and world musics. Van Domselaer's influence on ten Holt's musical philosophy has been considerable, with the younger composer picking up van Domselaer's interests in the links between music and visual art, in music's relationship with mathematics, and in the use of the piano as a principal instrument in his compositions. The music by Ten Holt is unique and attracts a new audience to classical music. PIANO DUO SANDRA & JEROEN VAN VEEN Sandra Mol (1968) and Jeroen van Veen (1969) met at the conservatory in Utrecht in 1987. Since then they play together sharing their passion for multiple piano music. 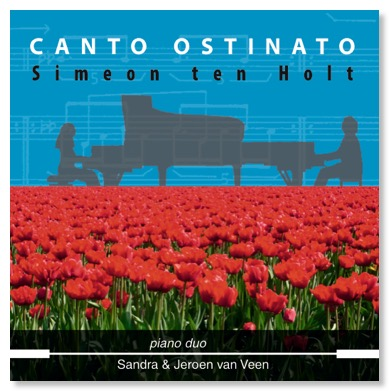 Their first Cd was a live recording presenting Canto Ostinato for two pianos by the Dutch “minimalist” Simeon ten Holt. This Cd was sold in more than 40 countries worldwide. Concerts and recitals brought Sandra & Jeroen from Miami to Novosibirsk. They are initiators of many concert series, among them the Amsterdam Concertgebouw and the Lek Art Festival in Culemborg. They recorded over 45 Cds in the last ten years. Besides playing piano they teach, adjudicate, compose music, and produce many different concert programs on a variety of common and uncommon concert locations such as railway stations.